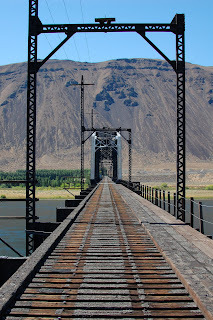 The Beverly Railroad Bridge, built in 1915, spans the Columbia in eastern Washington. It carried the Chicago, Milwaukee, St. Paul and Pacific Railroad westward towards Tacoma. This segment was electrified. It was abandoned in 1980, but is being preserved by the state. The river is perhaps 0.6mi (1km) wide at this point, and the bridge is a substantial structure. It is still in decent shape.